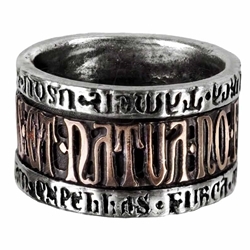 The Deus Et Natura ring represents triumphant harmony of Nature and the Creator. The gothic ring has a solid metal Latin band, reading, Deus Et Natura No Faciunt Frusta, or, God and Nature do not work together in vain. The edge inscriptions continue, reading, Nature will always win through. This Gothic ring is hand cast from fine English pewter. An advantage of this pewter Deus Et Natura ring is that it does not need regular polishing to maintain its gorgeous appearance. Pewter jewelry does not tarnish like silver jewelry. To keep your gothic Deus Et Natura ring bright and shiny, an occasional cleaning with a quality proprietary metal polish will keep it looking brilliant. This pewter gothic ring is made in Sheffield, England and crafted by master craftsman.